Locally owned, Maui Clothing Company has grown from its first family-run store 35 years ago to 23 stores across the Hawaiian Islands. 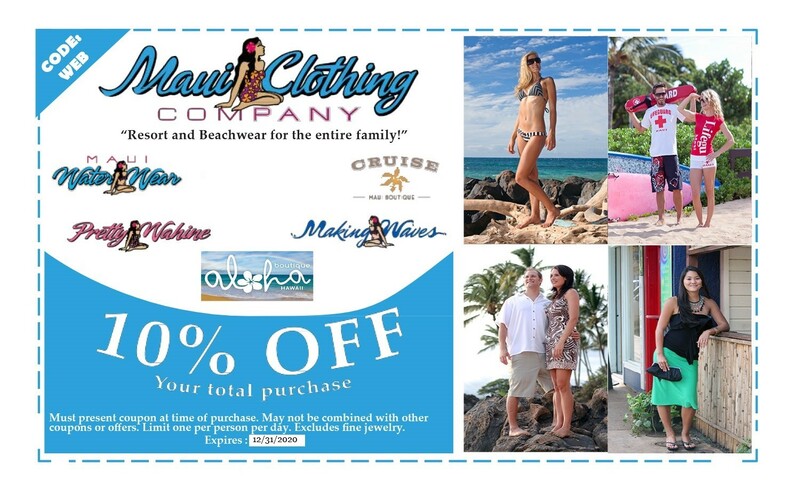 We carry Maui’s best selection of resort wear, beach wear, and aloha wear for the entire family. We offer a great selection of the most popular men’s lines including Tori Richard, Kahala, Tommy Bahama and Quiksilver. Women’s fashion includes everything you need for a casual day of sightseeing to a night on the town, with collections from Jams World, Tango Mango, Ocean Drive, Elan, Santiki, Fresh Produce and many more. We also have an incredible assortment of fashion jewelry, footwear, handbags, hats and accessories for every occasion. Looking for the perfect gift, souvenir or memory of your trip to Hawaii? We have that too! Be sure to visit our Jewelry department and treat yourself to something unique to the islands.